Robert conducts Toronto Private City Tours for this Great Wine Capital City through his company and with ToursByLocals www.toursbylocals.com/TorontoPrivateTours. since 2011. Robert's love for wine travel has sparked the idea to create this website for you to find information about wine regions, wine tours and lodging in these regions. Robert has been asked several times in the last few years by his friends to recommend good value wines . He is doing it now for a larger audience in his Wine Review page. 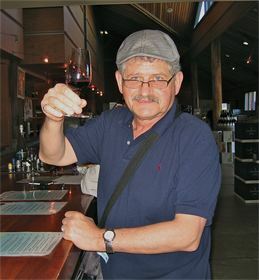 Robert has invited Wine Consultants like Ray Perchaluk to post Guest Blogs on Wine Blog page. Always seeking for new opportunities to expand his knowledge of wine and recently Robert has completed HOST 9008 (Wines I) of Wine Specialist Certificate course at George Brown College in Toronto at Hospitality and Culinary Arts School, with the Wine Doctor Edward Finstein www.winedoctor.ca. This course helped Robert to develop a greater formal knowledge of wines. 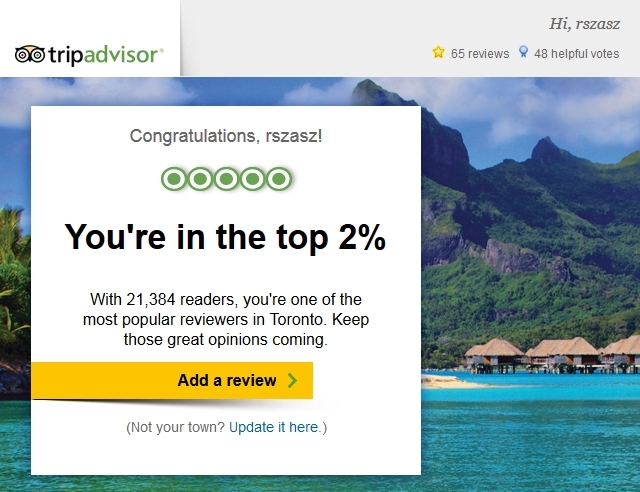 With 21,384 readers, you're one of the most popular reviewers in Toronto! ﻿Thank you so much – the tour was as scheduled and Ken and his Family had a memorable experience ! We had a dinner last night with our CEO and everyone and they had a really good time in Toronto. Ken said very informative and they were very comfortable with you. I will definitely keep you on file for our next tour and again thank you as I know it was kind of last minute. Hi Robert – we have now arrived safely back home. Just wanted to say thanks again to show us around downtown Toronto – we had a great time and really loved your city. Keep up the great work! Hi Robert I was just viewing your website . Very nice . I make my own wine at home. However my wife and I hold an interest in the wine regions , tours , varieties etc. Your site has a lot to offer . Thank you . I remember with pleasure the trip and guiding you offered me last year and the good time we had together. Some of my friends will be in Toronto in summer and they intend to contct you for a wine tour in the Niagara area. Again thank you and hope to meet you again. We met at the Australian tasting at the Ontario Art Gallery. You have an excellent web site. Hope to see you at other tastings. I like your new website for wine tourism....it looks great!!! I found this site and was thoroughly impressed. I am a b and b owner in Kelowna. My company is The Hopeless Romantic B and B. I have people from all over the world interested in researching more places to discover wine and wineries and events. This is site is fantastic as it has a wealth of information perfect for visitors from other area. Brovo! Peninsula Ridge Estate Winery; The Good Earth Food and Wine Co; The Angels Gate Winery.... Unforgettable experience! Such beautiful places, so peaceful, quite marvelous! Even if I’m not a wine connoisseur, the tour gave me the feeling of being one. For sure, from now on, a glass of wine will bring back very nice memories from this tour. Congratulations! Hi, I stepped through the web site pages and I discovered many things of interest. As a travel and history lover, I know that a good wine mixed with an interesting trip is always welcome. I hope to meet you in the near future. Click Travel & Lodging to book your vacation with our selected Owners and Tour operators. No booking fees !